CHS graduate Derek Sharp shared a bit about his personality and then challenged the ingenuity of the high school juniors in front of him, hoping to entice them to consider one of a dozen engineering fields at Kansas State University. “Does anyone like to build Legos?” Sharp asked. “(Math teacher Eric) Holmes does. I love to build Legos,” he told the students. When he was growing up, Sharp said he’d find himself taking things apart to see if he could put them back together or rebuild it because it could be built better. “If you like to solve problems …. If you look at something and think maybe this could be easier to use …. or like to figure out how things work – I like to do that a lot,” then engineering is a career field to consider, Sharp said. 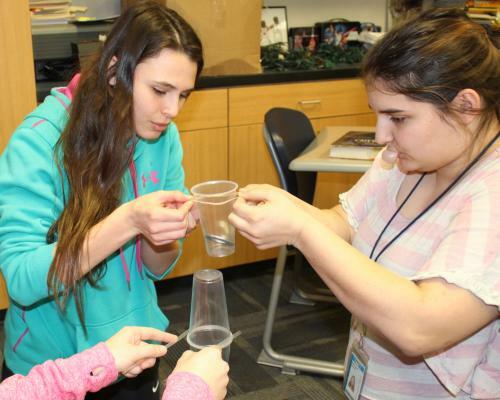 An engineering degree requires a lot of math and science, which is why Sharp and K-State recruiter Leanne Reineman spent the day at Chanute High School, talking with students in their honors math classes. Engineering is problem solving in the real world with math and science, Sharp said. He and Reineman issued a challenge. 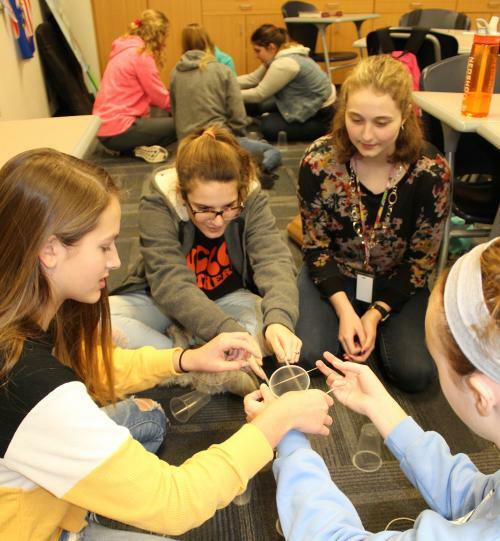 Working in small groups, the students were to build a free-standing tower with plastic cups as tall as they could, using only the supplies provided – string, rubber bands, straws – and without touching the cups. They had two minutes to discuss design and then start building. 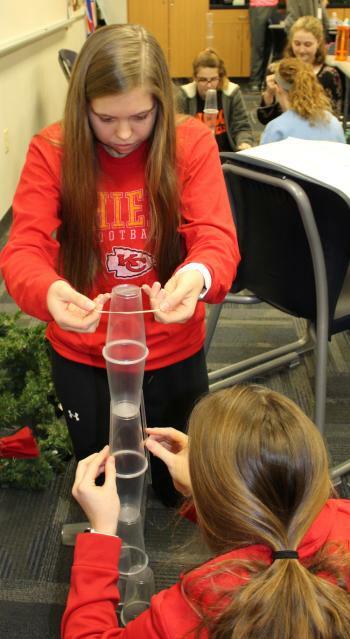 Juniors Amanda Stalder, Cheyenne DeVoe, Raegan Haight and Breuana DuVal won the contest with their tower that was eight cups high. Sharp asked what challenges they faced during construction. One student named a team member as the challenge. Another said there were too many people trying to do the same thing. Being able to work together is really important because people in different fields of engineering have to work together all the time, he said. An architectural engineer designs a project, but relies on mechanical and electrical engineers for infrastructure and a construction science engineer to oversee completion of the building. New career fields in engineering are opening up in the biomedical, chemical, and computer science area, especially with the growing field of cyber defense. While at CHS, Sharp played on the basketball team. At K-State, he still plays in a recreational league, and works on the two electric bikes he’s building. They’re never finished because he keeps rebuilding to make them better. K-State does have debate but they also have clubs for students who like to build, problem solve and compete, like the wildcat wind power team, steel bridge team, cyber defense club, and human-powered vehicle club. Another interesting face is that 25 percent of the engineering majors at K-State are in the marching band. Sharp issued an invitation for them to call him during office hours at 1:30 p.m. Fridays, and he’ll schedule a time to give them a tour of the campus. Until then, “taking honors courses at CHS and taking college credit classes sets you up for success,” he said.